The 2014 Manhattan Beach/Hermosa Beach Little League team made it to the World series by winning the West Region. 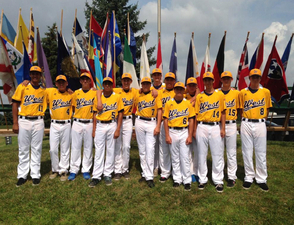 With nothing but wins behind them, a team of all stars from Manhattan Beach and Hermosa Beach Little Leagues is in Taylor, Michigan to play in the Junior (13- and 14-year olds) League World Series. Games among the 10 teams from around the world begin Saturday. Players come from both leagues since the leagues combined forces in the junior division during regular season play, said Mark Auville with Hermosa Beach Little League. The team flew to Michigan after winning the West Region tournament Tuesday in Vancouver, Washington. The boys beat an Arizona team 16-4 to take the Western Region Championship Tuesday. Joey Acosta was the winning pitcher. "The entire team was instrumental in the win over Arizona with their relentless offense," said Auville. "It was a great win for a spectacular team." The MB/HB team (seen here in their World Series uniforms) takes on each of the four USA regional winners beginning Saturday at 8 a.m. PST vs. North Carolina, followed by games against Delaware, Michigan and Texas on Monday through Wednesday. The USA Championship game will be Thursday, with the winner going to the World Series final on Saturday, Aug. 16. Games can also be viewed and listened to via streaming video at www.vaughnlive.tv/jlws. Those who sign up can participate in interactive chat with the broadcast team, according to the Junior League World series Facebook page. The championship Junior World Series games on August 16 can be watched live on ESPN.